For students taking courses in substance abuse and addictions counseling. 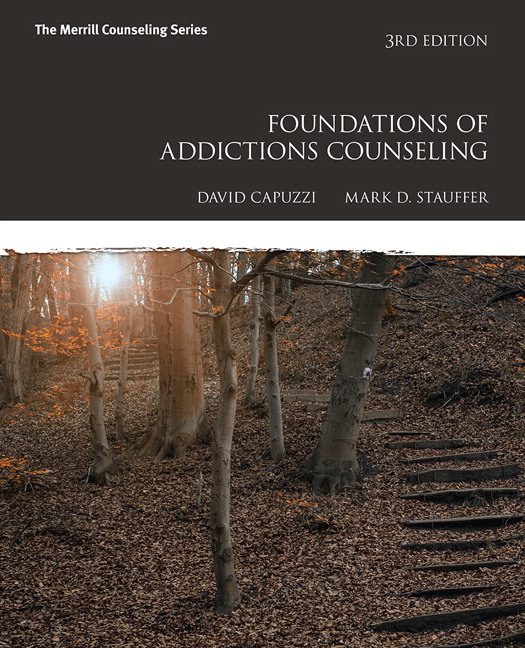 A practical collection of tools and strategies for prospective addictions counselors that includes a solid foundation of research, theory, and history. 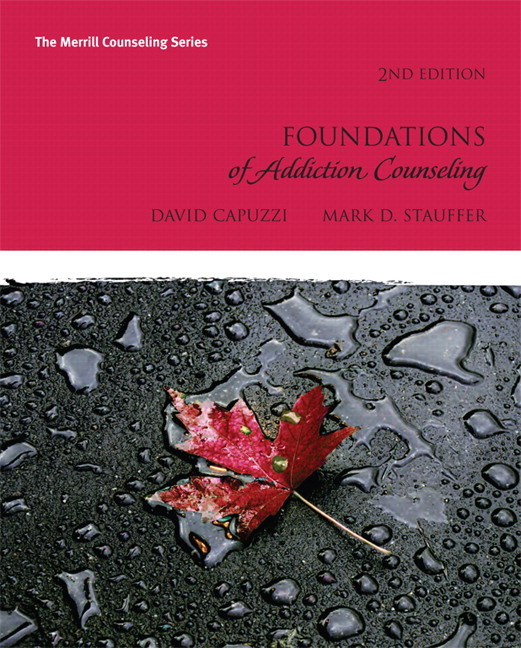 Practical and comprehensive, Foundations of Addiction Counseling explores an array of techniques and skills that a new practitioner will need in the real world while providing a thorough review of the research, theory, and history of addiction counseling. With chapters written by expert scholars, this text covers many topics in-depth often ignored by other comparable books, such as professional issues in addictions counseling, the assessment of client strengths, gender issues in substance abuse, working in rehabilitation centers, and working with clients with disabilities. The Third Edition of this unique text offers prospective counselors the tools and strategies they will need for outpatient and inpatient treatment, information about maintenance and relapse prevention, and counseling strategies for couples, families, children, adolescents, college students, and recovering addicts. The revised edition includes expanded discussions on a number of topics, new case studies, and completely updated resources and web references. Unique chapters on the assessment of client resources and strengths (Ch. 5) and gender issues in addiction counseling (Ch. 15) cover topics rarely addressed in other comparable addictions counseling texts. NEW: A new chapter (Ch. 20) dedicated to the process of rehabilitation in both inpatient and outpatient settings provides readers with even more information than in the second edition of the text. UPDATED: Prevention across the life span is addressed in this edition in a thoroughly revised chapter (Ch. 16). A complete chapter on working in rehabilitation centers and with clients with disabilities (Ch. 15) will help all prospective students, especially those with an interest in a rehabilitation specialization. A complete chapter on motivational interviewing (Ch. 7) explores the most widely used treatment approach in addiction counseling. A chapter on cross-cultural counseling (Ch. 17) presents a practitioner-focused approach to engaging ethnic diversity in the process of addictions counseling to engage the readership in a more dynamic and practical manner. A separate chapter on process addictions (Ch. 3) such as sexual addictions, gambling addictions, work addictions, and buying addictions offers readers a comprehensive and in-depth look at non-ingestive addictions. UPDATED: Case study sidebars, quick fact sidebars, and informational sidebars add a visual dimension that increases readability and interest for students. UPDATED: Integration of updated and current research from the field’s peer-reviewed journals keeps readers up-to-date with the latest findings in the field. A discussion of professional issues in addictions counseling gives prospective addiction counselors more pertinent information about their future field. An emphasis on clinical interviewing helps students better understand the importance of clinical interviewing in assessment. Concrete reference to assessment tools provide readers with the most current information and resources. UPDATED: The Instructor’s manual includes updated journaling exercises, group work, PowerPoints, and experiential exercises for the online as well as face-to-face classroom. A new chapter (Ch. 20) dedicated to the process of rehabilitation in both inpatient and outpatient settings provides readers with even more information than in the second edition of the text. Prevention across the life span is addressed in this edition in a thoroughly revised chapter (Ch. 16). Additional case studies located throughout the text further illustrate points and enliven class discussion. Updated case study sidebars, quick fact sidebars, and informational sidebars add a visual dimension that increases readability and interest for students. Integration of updated and current research from the field’s peer-reviewed journals keeps readers up-to-date with the latest findings in the field. David Capuzzi, PhD, NCC, LPC, is a counselor educator and member of the core faculty in clinical mental health counseling at Walden University and professor emeritus at Portland State University. Previously, he served as an affiliate professor in the Department of Counselor Education, Counseling Psychology, and Rehabilitation Services at Pennsylvania State University and Scholar in Residence in counselor education at Johns Hopkins University. He is past president of the American Counseling Association (ACA), formerly the American Association for Counseling and Development, and past chair of both the ACA Foundation and the ACA Insurance Trust. A frequent speaker and keynoter at professional conferences and institutes, Dr. Capuzzi has also consulted with a variety of school districts and community agencies interested in initiating prevention and intervention strategies for adolescents at risk for suicide. He has facilitated the development of suicide prevention, crisis management, and postvention programs in communities throughout the United States; provides training on the topics of youth at risk and grief and loss; and serves as an invited adjunct faculty member at other universities as time permits. Mark D. Stauffer, PhD, NCC, is a core faculty member in the clinical mental health counseling program at Walden University and a past co-chair of the American Counseling Association International Committee. He specialized in couples, marriage, and family counseling during his graduate work in the Counselor Education Program at Portland State University, where he received his master’s degree. He received his doctoral degree from Oregon State University, Department of Teacher and Counselor Education. He is a member of the International Association of Marriage and Family Counseling (IAMFC). As a clinician, Dr. Stauffer has worked in the Portland Metro Area in Oregon at crises centers and other nonprofit organizations working with low-income individuals, couples, and families. He has studied and trained in the Zen tradition, and presents locally and nationally on meditation and mindfulness-based therapies in counseling. His research focus has centered on Eastern methods and East–West collaboration. In private practice, Dr. Stauffer worked with couples and families from a family systems perspective.